This month, meet Mary Portelly, web volunteer! 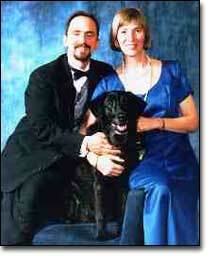 Me, with my husband, Ken and lab mix Troop at the 2001 Bark Ball. My husband and I adopted Casper 8 years ago from the Humane Society of Fairfax County - from a girl who (in my opinion) was doing a wonderful thing with her spare time - so once Casper was settled into our home, I decided to start volunteering too and have never looked back! For my paying job, I am a computer programmer and for the past few years, I have been getting into web development so I now also update the website for the SPCA of Northern Virginia. I find this extremely rewarding and still get a thrill every time I hear that an animal was placed because the person saw him/her on the website. Capser is a husky mix. He got me started volunteering in animal welfare. On the Metropets site, the main pages that I work on are the "Ask Sage" section, the Dog Park page and the Having Fun with your Dog page. I love "Ask Sage" because it enriches the pet owning experience for the readers and (indirectly) helps animals stay in their homes. The other two mirror my favorite activities!